… was just like any other tweet – I guess – but the difference is, that it made me realize that it has been ages and ages since I’ve actually written anything here, save perhaps an update or two. What better way to redeem myself than to elaborate on the tweet in question? Awesome, yet bad idea: Get Sylar to playtest your game. No matter what, he’ll always know how it works. See, the joke is – like many other jokes – requires some background knowledge, which at this point is two-fold: “Who/what the hell is Sylar?” and “Why would it be a bad idea?” The latter is probably the less important, but it still adds some depth to it all. Most people will get the Sylar-part, as many have seen him, Zachary Quinto, in the role of Gabriel Gray, in the Heroes series. The series is basically about various people who gets super powers through the genetic evolution of the human race. 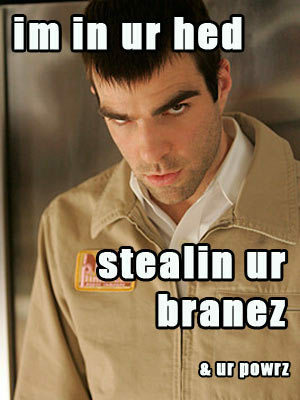 Sylar’s super-power is simple – he knows how things work. I guess that’s a given from the tweet itself, but that’s how that is it. Unfortunately, he’s also the perfect super-villain, as he spent that knowledge for his own benefits, and was always scheming on how to achieve more power. If we ignore the parts of him killing every single one of us to achieve the knowledge we have, being a fictional character, as well as stealing our super-powers, wha- . Yes, super-powers. I have some, you might not, but some of us have them. Carry on, it’s OK, we can’t all be super heroes after all. Now, disregarding all those bad things, why would it be bad to have a person who knows everything play-testing your game? Obvious – he knows how it works. The best testers is those that tries the product for the first time, and then tries to figure out how the game works, and slowly learns it – as it was intended in the first place. Not only that, but all the little quirks would be hidden until they got told or finds out by accident. Sylar? He would simply know it – even the secret moves that the programmers added in, but didn’t officially finish yet. I guess that’s also why jokes should never really be explained. Unless it wasn’t really a joke, but simply truth in compressed form – and thus, “it’s funny, because it’s true” applies. Success!